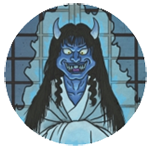 APPEARANCE: Ryūtō are kaika which appear just above the surface of the water on calm, peaceful nights. They create no heat, nor do they burn anything. They are only found in bodies of water which are home to dragons. BEHAVIOR: Ryūtō start out as single orbs of flame which hover a few meters above the surface of the water. They soon begin to multiply, until there are countless orbs. These fireballs float about aimlessly along the water, stretching and shrinking and morphing their shapes. Some of them sink back into the water. Others float up into the sky or nestle into the treetops. At dawn, they merge back together into one orb before vanishing back into the sea. INTERACTIONS: Ryūtō are considered by the Japanese to be a manifestation of light caused by the dragons which inhabit bodies of water. Areas where ryūtō routinely appear often have shrines near them, and the lights themselves are considered sacred. 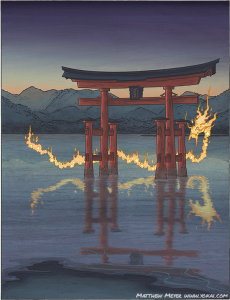 On nights that ryūtō appear, people gather along the shore to watch these dancing and changing holy flames. LEGENDS: The Itsukushima Shrine in Hiroshima Prefecture (old Bingo and Aki Provinces) is not only one of the most famous shrines in Japan, but also a popular sightseeing location for watching ryūtō. The lights appear on the tranquil surface of Hiroshima Bay for about a week starting on New Year’s Day. They are believed to appear because the Itsukushima Shrine is dedicated to the gods of the sea and thus is connected with Ryūjin.